Dinner Lady e-liquids are in high-demand with their nostalgic line up of flavors based on classic dessert dishes. These great value flavours are sweet and comforting concoctions that combine tried and true flavor profiles with the modern convenience of vaping; the perfect blend of old and new! Cornflakes with sweet syrup and fruity jam; Dinner Lady's Cornflake Tart is sure to take you back with this old-school flavour. This Cornflake Tart e-liquid captures the savoury bite of the popular cereal with rich syrup and a sweet blob of flavour-packed jam. 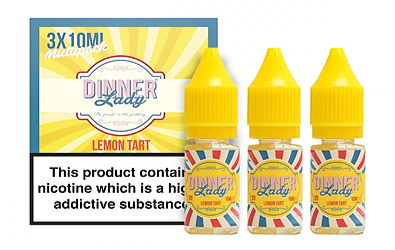 One of the UK's favourite e-liquids, Dinner Lady's Lemon Tart blends sharp and sweet lemon curd with creamy meringue and serves it up inside a buttery pastry crust, apturing the essence of that old dinner time favourite. Whether you loved it or hated it no one can deny the distinctive flavour of classic rice pudding. Based on the school dinners favourite, Rice Pudding from Dinner Lady is an authentic recreation of classic creamy rice pudding with a generous helping of raspberry jam. Smooth and rich in nostalgic flavours. 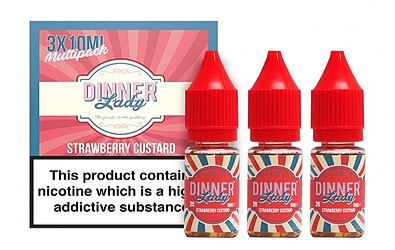 Dinner Lady's take on the ever-popular strawberry custard e-liquid flavour profile ramps up the sweetness with the addition of indulgent butter caramel flavours. 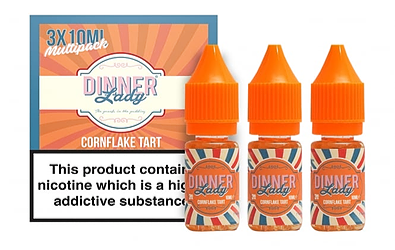 The blend of flavours is clever and smooth, making Strawberry Custard E-Liquid by Dinner Lady a must try for custard vape fans and anyone with a sweet tooth.